In a few weeks, Brisbane's newest toll road will be opening. It is called Airportlink M7 and as the name suggests, it will be a new motorway connection between the Brisbane International Airport and the outskirts of the Brisbane CBD, the Brisbane Inner City Bypass (which connects the west to the north) and the existing CleM7 toll tunnel bypass route to the south. I wrote previously about the Airportlink M7 road here, including how a loyalty programme has been planned for it. 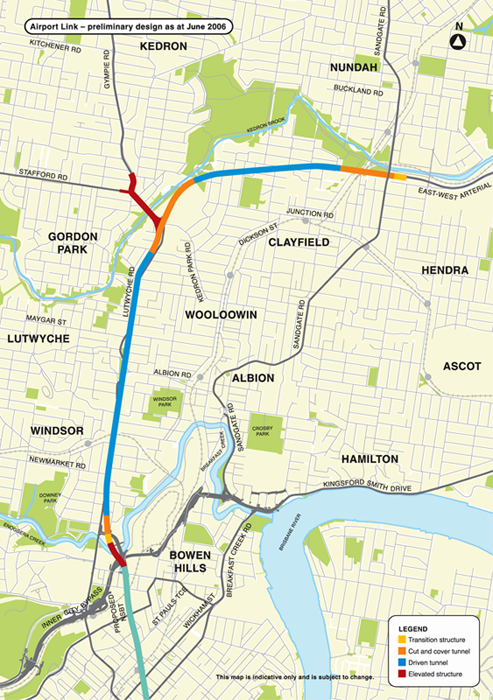 The total project cost is A$5.6 billion and is owned by a consortium called BrisConnections which is listed on the Australian Stock Exchange with a 45 year concession to finance, build and operate the road (and also related projects such as the Brisbane Northern Busway and Airport Roundabout Upgrade Projects). BrisConnections is underwritten by Macquarie Capital Advisers and Deutsche Bank. 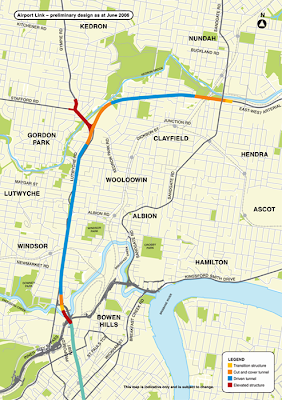 The road is a 6.7km long final connection for a high speed highway link from Brisbane Airport to downtown Brisbane, as well as feeding into the Clem 7 bypass tunnel towards the southern suburbs. Tolls will be collected using fully electronic free flow technology, with tags for account holders and automatic number plate recognition for occasional users and enforcement. Yet there will be a great deal of nervousness by investors, given the appalling performance of the Clem 7 toll tunnel in Brisbane, which has gone bankrupt amidst traffic levels that are well below half of that forecast in the investment prospectus. However, excitement and anticipation of success are heavily muted, largely because of the commercial failure of the CleM7 toll road. I wrote extensively about it here, here and here in essence that road went bankrupt and is now in administration, in part because actual traffic volumes are significantly below forecasts. Consultancy firm AECOM now faces legal action over the forecasts. However, AirportLink M7 has had its own problems. The extensive flooding in Brisbane over a year ago delayed construction completion and adding to the costs. More recently, The Australian reported that construction consortium Leightons is to be fined at least A$26.3 million (US$26.9 million) for delays in opening, at a rate of A$973,973 per day (US$997,000). It has already had to write down the project by about A$1 billion (US$1.02 billion). With opening planned in July, there is already a very elaborate website to promote it and nervousness abounds about whether demand will meet the forecasts. Forecasts for this road have been undertaken by Arup which has estimated 135,000 vehicles a day one month after opening (presuming there are tolls) rising to 291,000 by 2026. BrisConnections estimates it will get to about 165,000 a day after the ramp up period of the first few months. 1. The first month will be absolutely free for anyone who drives on the road. If demand doesn't exceed the 165,000 a day forecasts when free, investors will be particularly worried. 2. The following two months will continue to be free, but only to account holders. This includes existing account holders for Brisbane's other electronic free flow toll roads. It is reasonable to assume those who would never pay would mostly drop out at this time, but those who may see some occasional use of the road remain, but still volumes shouldn't drop much. I would question quite how enforcement will be pursued for those who don't have accounts, but examples will have to be made (or letters sent warning people if they repeat, they will be fined). 3. After that first three months, tolls will apply with a maximum of A$2.50 for use of the whole road by a car (US$2.56). This charge cap will last for six months. Which means until around March 2013. 4. Toll tariffs will rise to a maximum of A$3.75 (US$3.84) (yes a 50% hike), for another six months. That means until October 2013. 5. Finally tolls will reach their intended level of a maximum of A$4.90 (US$5.02). Light Commercial Vehicles will pay double the price of cars and HGVs more than triple. Those without tags/accounts will pay a A$0.86 surcharge (US$0.88) per trip. A$2.94 (US$3.01) surcharge applies to purchase of passes (single or multiple trip) by phone or in person. Account holders or online purchasers do not have this charge. The entire toll schedule is here. If demand can hold up to be anywhere near the forecast levels by then, I'll be surprised, given that it effectively doubles the price in one year. Intellectually it will be an interesting exercise in demand elasticities of tolling, and no doubt someone will do his or her transport economics thesis using this example. Chief Executive, Ray Wilson asserts these are achievable because he considers the fact the road connects the airport to the city to effectively mean a greater value of time and so greater potential to get a higher yield per motorist for this sort of highway. He sees Melbourne Citylink and Sydney’s Eastern Distributor as useful comparisons, even though the population bases of both cities are 3 times that of Brisbane, and Melbourne (unlike Brisbane) has no rail link to the airport. In addition, the previous routes in both Melbourne and Sydney were regularly subjected to severe congestion. Brisbane doesn't have quite as bad a problem. He has a point, but I'd still be cautious, and I'd be surprised if the toll ramp up in price happens as rapidly as has been disclosed. I can see a longer term rise from A$2.50 to A$3.75 (perhaps over 1-2 years) with the same to A$4.90. Also in the Sydney Morning Herald, Andrew Chambers, a research analyst at Legg Mason, expects traffic levels to be well below forecasts. I share that view, especially as some motorists may be attracted back to the existing route once enough have shifted to the toll road to make the existing route much less congested. Time savings forecast are to reduce travel times by between 60 and 88% depending on the trip and time of day, with claims of actual savings ranging between nearly 5 minutes and over 20 minutes per trip depending on the actual route. These are noticeable, but will obviously vary by time of day according to congestion levels. Of course whatever happens, the road will be built, it will be a great asset for the city (will probably reduce patronage of the Brisbane airport rail link which opened in 2001) and hopefully the strategy of staggered toll increases will work. In addition, the creditors of CleM7 will be hoping that Airportlink M7 will feed enough extra traffic down their road that they can start to break even.